Murray has broken once, when Federer was last serving to win the match! Hold on a second, arguably the shot of the match as Murray pulls off a staggering cross-court forehand before firing an effort at Federer who was stood at the net in the next point. 0-30. When was Fed serving to stay in the match? Sorry, to win the match! Everything is crossed, even my eyes!! He had two match points one hour ago. Time for a third. A huge ace out wide wins it. Tough to take for Murray but thrilling tennis from Roger Federer. Oooh well - thanks Tom! Thanks for giving me the 'eyes' I didn't have for this match Tom - lucky you! YES Easy in the end, nice one roger. Apology accepted lol. What a wonderful game tennis is, especially when you have 2 players on court such as these. Thank you Tom for keeping us excited in the past hours. Roger Federer - I miss more break points than most of the other guys so I'm used to it! 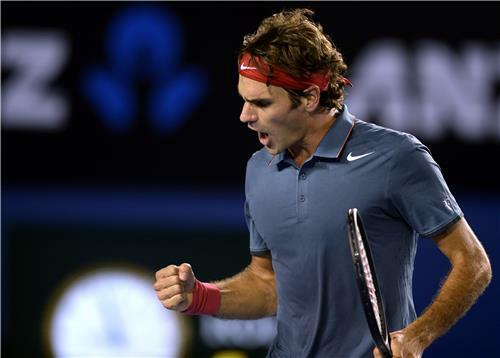 Roger Federer is into the last four of the Australian Open for the 11th year in a row. That is some achievement. Murray couldn't stand a chance, his game is just not at the top. Roger Federer - I'm happy now that the last four months has paid off and I'm into the semi-finals so it's a great start to the season for me. In truth, Murray would have not fancied his chances of winning this tournament going into it following his back injury. He pretty much said as much as was playing down his chances but today showed what he can still produce even when not at the top of his game. But Federer playing the type of tennis he did for the first two sets at least is very refreshing. Played some brilliant tennis and just reminded us all how good he was and still is. Well guys, that's all from me. Thanks very much for your input this morning. A brilliant match, tough slog and Andy falls at the quarter-final stage but I'm sure he will be a major player in all the Grand Slams again this year.